Why is there such a powerful spiritual struggle for the hearts and minds of our young people? . . . Why is cultural tolerance so pervasive in todays world--showing up in education, government, society. . .even within the church? . . . And. . . What can I do about it? If you've ever thought about or asked these questions, you'll find trustworthy answers in The Beauty of Intolerance Study Guide. Josh McDowell has been at the forefront of cultural trends and groundbreaking ministry for over five decades. He shares the essentials of the Christian faith in everyday language so that youth, families, churches, leaders, and individuals of all ages are prepared for the life of faith and the work of the ministry. This includes leveraging resources based on years of experiences, new technologies, and strategic partnerships. Since 1961, Josh has delivered more than 27,000 talks to over 25,000,000 people in 125 countries. He is the author or coauthor of 142 books, including More Than a Carpenter and New Evidence That Demands a Verdict, recognized by World Magazine as one of the top 40 books of the twentieth century. Josh's books are available in over 100 different languages. Josh and his wife,Dottie, are quick to acknowledge that after their love for the Lord, family is their greatest joy and top priority. They have been married for 46 years and have four wonderful children and ten beloved grandchildren. For more information, please visit www.josh.org. 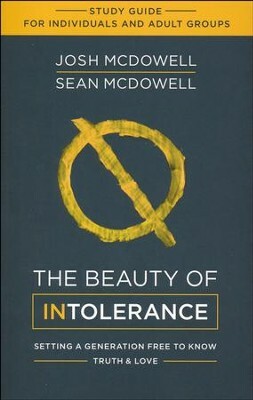 Sean McDowell, PhD, is an assistant professor at Biola University in the MA Christian apologetics program. He is also a bestselling author of over fifteen books. Sean is an internationally recognized speaker for conferences, universities, schools, and churches. He and his wife Stephanie and their three kids live in Southern California. 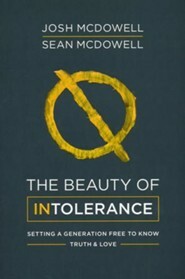 I'm the author/artist and I want to review Beauty of Intolerance Study Guide.